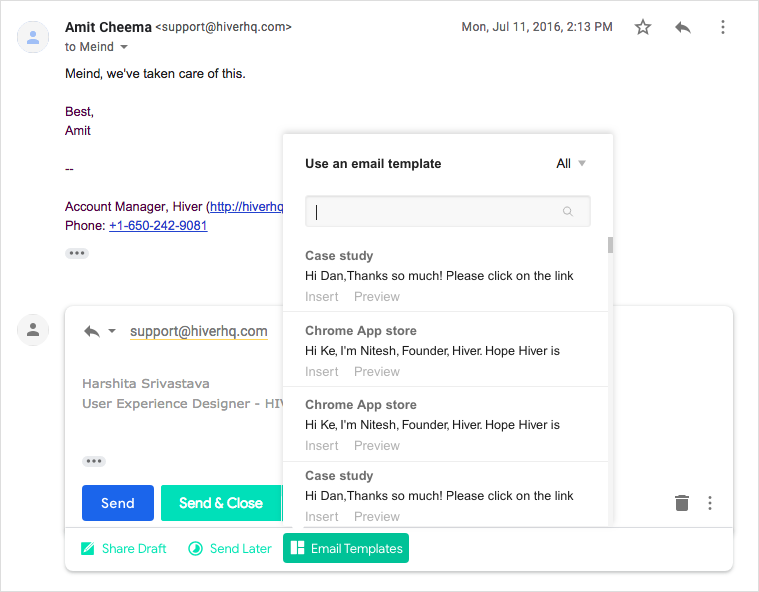 Email templates let you save some text, and easily embed it into any email you are composing. It is a great way to save time that would otherwise be wasted in writing the same or similar emails repeatedly. Email templates can be grouped into folders, which can be shared with other users in your Hiver account. One good way of grouping templates into folders is to think of the group of people who would all need access to the same set of email templates. Then, create a folder shared with that group of people, and put all templates this group needs access to in that folder. Only Admins can create folders. Hiver automatically creates a folder called "Shared with All" for you. Any email templates you put in this folder are shared with all users in your Hiver account. Enter the name of the folder, the list of people this folder needs to be shared with, and save the folder. Admins can add 'new users' who are not a part of the Hiver account to folders. Non Admins cannot add new users, however they can add users who have been 'invited' but not a part of the Hiver account. A template can only exist inside a folder. You can create a template within a folder or move a template from one folder to another. Go to the Email Templates section, and click on the 'Create New Template' button. You can also go into the folder you want to create the template in, and click the button. Enter the contents of the template, select or change the folder that you want the template to be in, and save it. Please note that the template is automatically shared with the folder the template is in. Make the changes you need to make, and the save. Non Admins can only 'edit/delete' templates which they have created themselves. They cannot 'edit/delete' templates which have been shared with them. The ‘Subject’ from the template is copied on the email. The ‘Name’ is not copied anywhere on the email and is for your reference only. All Hiver users (Admins as well as Non-Admins) can create email templates. Admins can view and edit all the templates, even if they are not shared with them. Non Admins can view and edit only the templates only the templates which they have created or which have been shared with them. Click on the template to embed it into the email. You can also search by the template’s name or subject to locate the template you want to use. You can use four autofill variables in your Email Templates which will get automatically filled when the template is inserted in an email. These variables will pick the values automatically from the ‘To’ field while composing or replying to emails. Hiver also supports default options, incase any information is not available. Highlight any text/ link in the body of the template and click on 'link icon' to get a prompt asking you the URL where the link will point to. You can edit the HTML source of the template. To do so click on the "<>Source" icon. You can insert any publicly hosted image on Hiver templates. If you have your own image, you can host it on any free image hosting site and insert its URL into the template. For example, if you want to host your images on imgur.com, which is a free image hosting site, you can follow the given steps. 1.Go to imgur.com, click on "New Post" and upload your image. 2. Once your image has been uploaded, right click on the image, open image in new tab and copy the URL. 3. When creating or editing the template, click on the 'Image' button from the menu of formatting tools to open the 'Image Properties' window. Enter the URL that you just copied in the URL field and the image will appear in the template. If you want to insert an image from the internet, then do a right click on the image, click on 'Copy image address' and paste that on the Image URL on the template(as mentioned above).